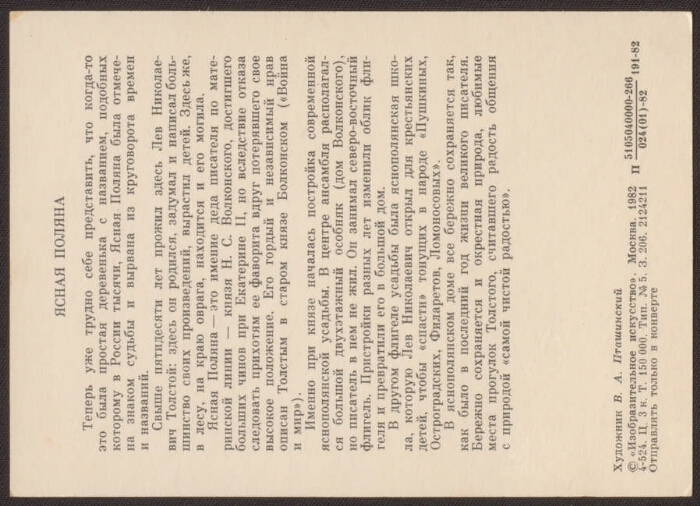 On the back of the text about the estate "Yasnaya Polyana." 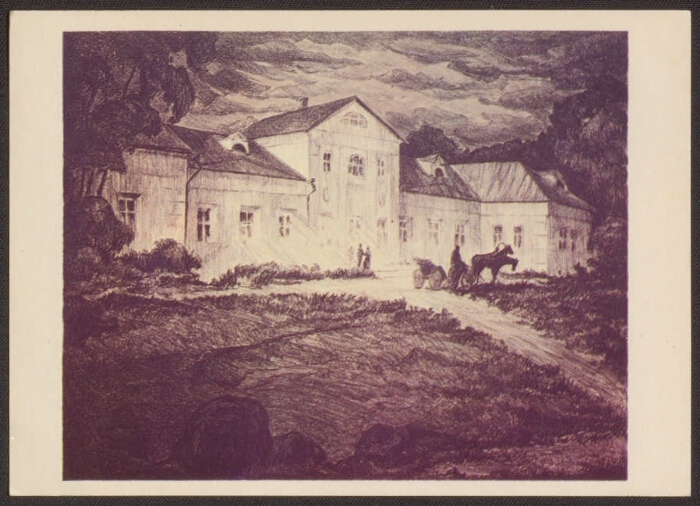 Electronic reproduction of the postcard: Yasnaya Polyana. Artist VA Ptashinsky [Izomaterial]. Moscow: Fine Arts, 1982. 1 postcard: offset. Send only in the envelope. The circulation is 150,000 copies. 4-524. The price is 3 kop. Location: Children's Memorial Museum, St. Petersburg. I. Ptashinsky, Vladimir Alexandrovich (artist, 1922-1982). II. "Yasnaya Polyana", the museum-estate of Leo Tolstoy. "The Museum-Estate of Leo Tolstoy" Yasnaya Polyana ", the State Memorial and Nature Reserve - in Fine Arts - Postcards 2. Postcards in the Presidential Library Fund (collection) 3. Territory (collection) 4. Russian language (collection) 5. Russia in Faces (collection) 6. LN Tolstoy (collection) 7. Art postcards - USSR - 1945-1991.